Correspondence: Associate Professor Carmel M. Martin, Clinical Sciences Division, Northern Ontario School of Medicine, 372 Rideau Street, Suite 221, Ottawa, ON K1N 1G7, Canada. Accepted for publication 27 March 2006. Background: General practice works within a primary health care system that continually undergoes reforms in order to respond to changing demands of transitions in population health needs and economic environments. Yet there is little understanding of the systems of care. Aims and Objectives: This is the second article in a two-part series. The aim of this paper is to broaden the intellectual vision and conceptual framework of family medicine within primary health care systems and present a feasible model for the future. Key issues: General practice must develop new models to define itself as an action-oriented clinical discipline with respect to its role in the health care system. Its legitimacy comes from its patient-centred approach in health care and through promoting health as a personal experience. This approach requires the discipline to strategically engage in research, education and policy development. Viewing primary health care and the contribution of general practice within a systems framework, allows the identification of the complex dynamics and interdependencies of care provided in various systems and subsystems in health care. To achieve this requires a shift in general practice thinking and leadership that focuses simultaneously on patients and their health, the organizational level and the connecting patterns, both within and across the layers in the system. The introduction of diabetes mini-clinics into Australian general practice is an example of how leadership in general practice was able to engage local health administrators, providers and patients to develop an integrated service model, and then demonstrate how these changes affected patients, providers and office staff. The mini-clinic service delivery generated data at the regional and national levels that demonstrate improvements in population health outcomes and informed future policy developments at the system’s macro-level. Conclusion: Placing the patient at the center of care and understanding the importance of the system-based context of general practice/family medicine provides the way forward in changing primary health care systems. In order to translate the new thinking into practice and policy we need leaders and organizations that have the courage to champion and deliver an evolving vision and framework, and allow internal local solutions to emerge. General practice/family medicine must conceptually and empirically develop new models that define its roles and responsibilities in the health care system. Its legitimacy comes from its patient-centred approach in health care and its commitment to health as an individual personal experience, as well as a collective of experiences in populations. This approach requires the discipline to strategically engage in research, education and policy development. In Part 1 of this article (Asia Pacific Family Medicine, Vol. 5, Issue 2), we demonstrated that the current narrow understanding by practitioners, administrators and decision-makers about health and health systems threatens the sustainability of Western health care approaches. Solutions to the crises in health care, especially in relation to general practice/family medicine, is more likely to be solved by embracing innovative solutions that emerge from its chaos and complexity than by trying to fix cracks and gaps in the existing framework. In devising a future vision for general practice/family medicine, the pressing question seems to be: how to achieve the goal of patient-centred care that embraces the multidimensional interactions between the individual and his/her environment within a complex multilayered primary health care system? We believe the focus in the health care debate has to shift. The “patient”, and “health” as a personal experience•¤ needs to be moved to the center of our focus, while simultaneously acknowledging the collective experience of individuals within a community. Individual experiences can then be understood as being embedded in the context of patients’ “complex environments”. General practice must take a leadership and advocacy role in these shifts in clinical care and in health care organizations. General practice has typically operated at the microlevel of direct patient care and to a lesser extent at the other levels. Increasingly system reorganizations (macro-level) directly impact on clinical care delivery and microlevel working conditions. Health care continues to expand beyond the doctor-patient relationship base into broader team care and population-based approaches that involve interactions with bureaucrats. The policy initiative to improve diabetes care in Australia illustrates this approach. Collaboratives of local general practitioners, allied health professionals and local health authorities developed various local service models, one being a diabetic miniclinic model, where general practitioners and diabetes educators jointly provided and co-ordinate all of the required care at the patient’s usual place of care.10 For this model to function everyone had to change – a new equilibrium emerged leading to an accepted new standard for integrated multidisciplinary care (Fig. 1 – right hand side). Shifts occurred at the macro-level with responsibility and resources having been delegated to the meso and microlevels, and general practitioners operating at the microlevel engaging into both nanolevel (organismic) health outcomes and mesolevel team organization agendas. •	Academic – What is the new knowledge base of the discipline? How do we translate it into daily practice and systems interventions and maintenance? •	Leadership and advocacy – How do we inform policy and decision-makers? How do we engage professional associations? Success in these two domains requires a shift in focus. The first challenge will be to redefine health through a patient-centred approach within a systems-based framework. The somato-psycho-socio-semiotic paradigm of health11–13 offers a suitable patient-centred approach. 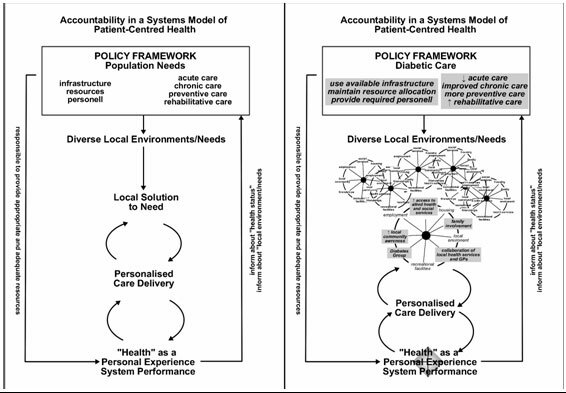 The vortex model of health allows the integration of all elements of the health care system and their functions into a systems framework (Fig. 2). The role of the general practitioner in primary health care is by definition generalist, holistic, and patient- and community-centred. Much of what makes the discipline’s work valuable is based on tacit rather than explicit knowledge.14 Explicit knowledge consists of facts, rules, relationships and policies that can be faithfully codified on paper and implemented without discussion. Tacit knowledge is gained from knowing patients in their humanity and understanding the subtleties of their environments. Tacit knowledge is difficult to quantify and is a more complex form of knowledge that requires different sources and inputs, and is non-linear. Knowledge underpinning evidence-based guidelines is an example of explicit knowledge, it is easily appropriated by decision-makers and funders. On the other hand, knowing that this patient’s headache represents his/her passive-aggressive feelings toward his/her in-laws is an example of tacit knowledge, knowledge that resides with the doctor. As Hjortdahl has shown (tacit) knowledge about a patient accumulates slowly, requiring a minimum of five visits and may take up to 5 years.15 The mechanisms of knowledge creation in general practice have been described by Stange et al.16 who identified the focus of knowledge, the tasks of understanding, and appropriate modes of understanding as the key domains of inner and outer reality (tacit and explicit) at individual and collective levels. General practice’s evolving roles and responsibilities require a multilevel approach that includes the individual provider, group/team, the organization, and the environment (Fig. 2),21 with recognition that even small changes in any one of the four contexts will affect others, both across, and between all levels of the “health care system”. An example of this might be the closure of a local hospital which may be an apparent efficiency gain at the macrolevel, but may put pressures on the microlevel by forcing larger numbers of complex patients to be managed in the home by the general practice team. Macro or policy-level: Policy and financial frameworks need to address population needs as well as the needs of vulnerable groups. The principle of optimal health for all citizens is central to policy innovations in any model of primary health care. Currently prescriptive, “top down”, hierarchical and linear policy approaches predominate. 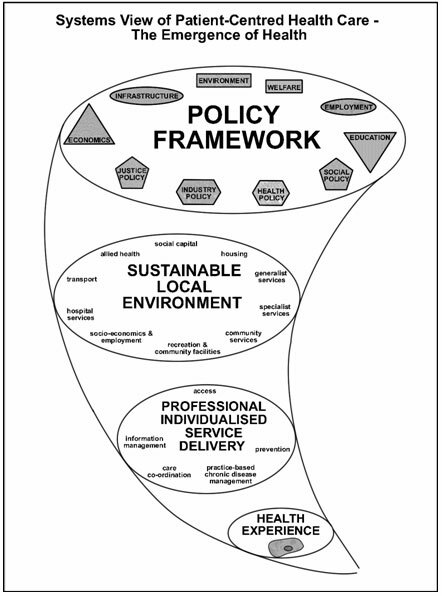 In “bottom up” approaches, general practice may advocate for patients and lobby for strategies that provide considered multimodal frameworks in which all stakeholders work together to develop locally appropriate solutions. Meso or organizational and local-level: Addressing health needs and health related determinants at a regional/local level requires coordinated responses from both health providers and administrators. In order to facilitate the evolution of new, locally relevant service models, it is important to allow key stakeholders to operate in an open rather than heavily prescriptive planning environment. For example, the general practitioner/family physician, thus has a developing organizational and knowledge brokerage role in interdisciplinary and intersectoral care, and in the uptake of new technologies, while at the same time maintaining the core principles of personalized care delivery. This requires the translation of research knowledge, ensuring patients’ equity and access to timely health care, and the sharing and coordinating of health care between the wide range of health care and non-health agencies. Micro or individual-level: Patients and their communities are the center point around which care is provided and organized. The effectiveness of the roles and responsibilities of general practice rests in the consultation and the personalized interaction of the doctor/provider with an individual. The consultation is the basic “production unit” in medicine – here decisions about resource consumption are negotiated between the doctor and the patient.25 Yet roles and responsibilities in this area are evolving with care delegation, new patient expectations, electronic information systems and internet medicine. Crucially there is an increasing advocacy and leadership role to keep the patient (not a disease, a cost or a multidisciplinary team) central to the health system and to ensure their core care remains continuous, coordinated, relationship-based and located in primary health care. Nano or organismic-level: The level of health – subjective as well as objective – reflects the entire impact of the forces influencing human health. Health perception, that is, the subjective experience of health or disease, is the result of the person’s interdependence,26 (a term coined by Ban-Yar) with his/her environment. In other words, a patient’s experience of healthcare is an outcome reflecting the effectiveness of consultations – nature and nurture, and the workings of the health system at large. However, in the end it is the organism and its embodied experiences of mind, body and emotion that we label “health”. This is where health care is directed and has its raison d’être. The judgement of primary health care success is ultimately located at this level. Increasingly this is where the role and responsibility of general practice lies. Leaders in general practice have to engage with the practicing profession, local stakeholders, academics and bureaucrats. All levels have to feed back about the goals and the progress made toward achieving patient-centred, locally responsive health care. For this approach to work, responsibilities need to be defined for each level of the system. Ferlie and Shortell21 argue that initiatives to improve quality (such as research on the determinants of quality), should proceed on four areas, consistent with those laid out in this article. Organizational dimensions (leadership, culture, team development, and information technology) play a crucial role (Table 1). •	Present methods in established institutions are part of the problem, not the solution. •	New systems will develop by returning to the patient to both identify and support strategies that fulfil unmet patient needs. •	Avoid programmatic implementations and utilize the ingenuity of the people who do the work to make improvements based on meeting patient needs. •	Success is built on replicating effective principles, not methods that must be customised. “Disruptive innovation” strategies create the environments that allow novel ideas to grow. It is most important for leaders to protect these strategies so that they can expand and improve. There is a strong need to protect ideas that run counter to the established processes and values of organizations and institutions. At on organizational level leadership has to become predictive in its point of view and must develop flexible and innovative strategies.28 Such leadership depends on effective intelligence gathering, reflective self-awareness, and the translation and dissemination of knowledge into sophisticated policy development. Practically, there is a need for policy experts and academics to work with clinicians to translate both patient-centred care knowledge (tacit and explicit), and social, clinical and organizational systems into a common primary health care language. At the policy level general practice/family medicine needs to reframe primary health care theory and engage in the development of policy frameworks that allow local implementation. Effective policy has to be responsive to the changing care and support needs of populations undergoing social, demographic and economic transformations. There is a need to strengthen the existing research and policy developments of the discipline, which have a proven track record in responding to the needs of the chronically ill, the disadvantaged, the frail, and other underserved groups in the community. Professional leadership should be able to enhance the understanding of the importance of primary care policy and research to a traditionally service-oriented workforce, as well as to decision-makers. Such dedicated policy leadership is most effective when it fosters connections among clinicians and academics such that innovations and ideas can emerge from practical understandings of organizations and health care deliverers, which are particularly needed to influence the macro- and mesolevel of health care. In addition, a dedicated clinical leadership must be competent to lead and manage the practical implementation of primary health care research findings for contemporary health problems into the community. The key issues at a time of major primary health care evolution should be a re-definition of our roles, responsibilities and the delivery of primary health care in different health care settings. Systems thinking provides a better framework to fully understand “health” as an individual construct, within the shared planning of health care. Within a system framework qualitative and quantitative data, accumulated from health policy makers, local health services, health care providers and patients, will enhance the knowledge base of the discipline. Responsible delivery (and equitable rationing) of effective care – based on best knowledge as well as practical wisdom (phronesis) – can thus occur in a transparent way to individuals and communities based on the strengths of the doctor–patient or other provider–patient relationships. Constructing the future of general practice thus must build on different types of research evidence and stakeholder perspectives, recognizing that there are simple patterns and connections underlying the various health system layers. A variety of contingent factors influence efforts to organize and improve care across complex layers of the primary health care system. Each effort must balance a number of trade-offs between centralization and decentralization in efforts to sustain the impetus for quality improvement over time. The multilevel change framework and associated properties provide a structure for assessing progress along the journey. Improvements must be based on meeting patients’ needs through replicating effective principles with enabling infrastructure, not on implementing processes that are customised in relation to narrow formulae. Health care and general practice/family medicine organizations must have the courage to be disruptive to innovate, and to take control of their roles and responsibilities in evolving primary health care systems. 1	Hogan S, Hogan S. How Will the Ageing of the Population Affect Health Care Needs and Costs in the Foreseeable Future? http://collection.nlc-bnc.ca/100/200/301/pco-bcp/commissions-ef/future_health_care-ef/discussion_paper-e/no25/25_e.pdf Commission of the Future of Healthcare in Canada, 2002. 2	Shi L, Starfield B, Politzer R, Regan J. Primary care, self-rated health, and reductions in social disparities in health. Health Services Res 2002; 37: 529–50. 3	Council on Graduate Medical Education. Update on the Physician Workforce. http://www.cogme.gov/resource_update3.htm Council on Graduate Medical Education, 2000. 4	Biola H, Green L, Phillips R, Guirguis-Blake J, Fryer G. The U.S. primary care physician workforce: Persistently declining interest in primary care medical specialties. Am Fam Phys 2003; 68: 1484 (http://www.aafp.org/afp/20031015/graham2.html ). 5	Canadian College of Family Physicians. . The Janus Project: Family Physicians Meeting the Needs of Tomorrow’s Society. http://www.cfpc.ca/research/janus/janushome.asp 2001. 6	Royal College of General Practitioners. The Primary Care Workforce – An Update for the New Millennium. http://www.rcgp.org.uk/corporate/position/careupdate/index.asp 2000. 7	Royal Australian College of General Practitioners. The Supply of General Practitioners in Outer Metropolitan Areas: RACGP Position. http://www.racgp.org.au/document.asp?id=9326 2003. 8	Bloor K, Maynard A. Planning human resources in health care: Towards an economic approach. An international comparative review. Canadian Health Services Research Foundation. (National Informants: Australia: Professor Jane Hall. Centre for Health Economics Research and Evaluation France: Dr Phillippe Ulmann, Conservatoire National des Arts et Metiers de Paris; Germany: Dr Oliver Farhauer. Technical University, Berlin and. European Centre for Comparative Government and Public Policy; Sweden: Professor Bjõrn Lindgren. Lund University 2003). 9	Green L. The View From 2020. How Family Practice Failed. Fam Med 2001; 33: 320–4. 10	Sturmberg J, Overend D. General practice based diabetes clinics. Aust Fam Phys 1999; 28: 240–5. 11	Pauli H, White K, McWhinney I. Medical education, research, and scientific thinking in the 21st Century (Part one of three). Ed Health 2000; 13: 15–25. 12	Pauli H, White K, McWhinney I. Medical education, research, and scientific thinking in the 21st Century (Part two of three). Ed Health 2000; 13: 165–72. 13	Pauli H, White K, McWhinney I. Medical education, research, and scientific thinking in the 21st Century (Part three of three). Ed Health 2000; 13: 173–86. 14	Polanyi M. Personal Knowledge. Towards a Post-Critical Philosophy. London: Routledge, 1958. 15	Hjortdahl P. Continuity of care. general practitioners’ knowledge about, and sense of responsibility toward their patients. Fam Pract 1992; 9: 3–8. 16	Stange K, Miller L, McWhinney I. Developing the knowledge base of family practice. Fam Med 2001; 33: 286–97. 17	Martin C, Peterson C. Transdisciplinary challenges for health service research and evaluation in general practice: the case of chronic disease management. Aust J Prim Health-Interchange 1997; 3: 32–43. 18	Wyatt J. Management of explicit and tacit knowledge. J R Soc Med 2001; 94: 6–9. 19	Greenhalgh T, Robert G, Macfarlane F, Bate P, Kyriakidou O. Diffusion of innovations in service organisations: systematic literature review and recommendations for future research. Milbank Q 2004; 82: 581–630. 20	Kurtz C, Snowden D. The new dynamics of strategy: Sense-making in a complex and complicated world. IBM Systems J 2003; 42: 462–83. 21	Ferlie E, Shortell S. Improving the quality of health care in the United Kingdom and the United States: a framework for change. Milbank Q 2001; 79: 281–315. 22	Moes M. Plato’s Conception of the Relationship between Moral Philosophy and Medicine. Perspect Biol Med 2001; 44: 353–67. 23	Fugelli P. Clinical practice. between Aristotle and Cochrane. Schweizer Medizinische Wochenschrift 1998; 128: 184–8. 24	Fugelli P. Trust in general practice. Br J Gen Pract 2001; 51: 575–9. 25	Hart J. Expectations of health care: promoted, managed or shared? Health Expect 1998; 1: 3–13. 26	Bar-Yam Y. Concepts in Complex Systems. Web Publication. Copyright 2000 Yaneer Bar-Yam. All rights reserved. Available at: http://necsi.org/guide/concepts/ Accessed 20 November 2006. 27	Kenagy J, Christensen C. Disruptive Innovation – New Diagnosis and Treatment for the Systemic Maladies of Healthcare. Business Briefing: Global Healthcare 2002: http://www.wmrc.com/businessbriefing/pdf/healthcare2002/book/kenagy.pdf 2002. 28	Glanz K, Lewis, FM, Rimer, BK. Health Behaviour and Health Education, 2nd edn. San Francisco: Jossey-Bass Publishing 1997, Chapter 13 pp 279. Nano (organismic)-level – about individual health through human mind and body incorporating new understandings about experience and consciousness (embodiment), nanolevel processes genomics, proteomics to telerobotic treatments and impacts. Microlevel – the individualized primary care doctor–patient and other patient–practitioner relationships, the consultation. Mesolevel – primary health care – the primary care team, the practice/office, links to acute and long-term health care, the local community, other local services including education, law, welfare. Genomics is the the study of genes and their function, while proteomics is the study of proteins within genes. †Recent advances in genomics and proteomics are bringing about a revolution in our understanding of the molecular mechanisms of disease, including the complex interplay of genetic and environmental factors. Genomics and proteomics are also stimulating the discovery of breakthrough healthcare products by revealing thousands of new biological targets for the development of drugs, and by giving scientists innovative ways to design new drugs, vaccines and DNA diagnostics. Telerobotics, remote operation systems which mimic human movements through machinery, ‡ are developing with the capacity to operate at many levels of the body, but most dramatically to implement gene and protein based therapies.